Finally, an affordable, easy-to-use business travel solution for the modern professional. Today, we are incredibly excited to launch Travelstop. 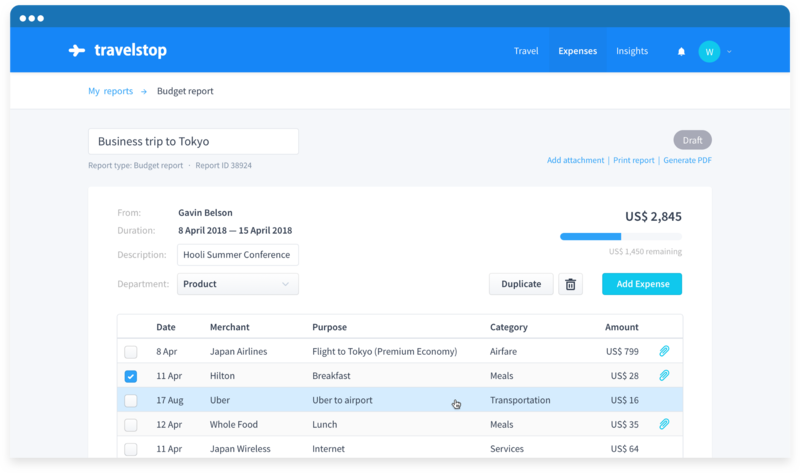 Travelstop is a modern solution for business travel that makes it easy to manage business trips, automate expense reporting, and provide meaningful insights. If you haven’t already, sign up and get started for free. As both employees and employers at our previous companies, we experienced first-hand the many frustrations businesses faced when it came to business travel planning and expense reporting. As employers, we were faced with limited options for managing business travel, many of which were not SME-friendly at all. As employees, we wasted an incredible amount of time wrangling with paperwork and rigid travel policies, contributing to a sub-par, unglamorous experience when out in the field. In an age of rapid innovation, we felt it was unacceptable that the business travel market — which hit $1.2 trillion globally in 2015 — would be so far behind the curve. In particular, the Asia Pacific region takes up 40% of this pie, making it the most significant business travel market in the world. And business travel spending in this region is expected to double by 2025. Existing business travel tools have not kept pace with the modern business traveller, and are generally not affordable by SME standards. In the meantime, leisure travellers were enjoying a host of cheap, convenient booking options, thanks to online travel agencies such as Expedia and Agoda. This was a massive pain point, in an equally large market, just waiting to be solved. So we decided to tackle this problem head-on and build something that we would love to use ourselves. We wanted to bring all the product innovation happening in the consumer space to the enterprise world, leveraging technologies such as machine learning and AI-driven personalisation to build a compelling and modern experience for today’s business traveller. Which is why we started Travelstop, a modern travel platform aimed at simplifying business travel. Using advanced technology, we want to help employers keep costs low, allow a degree of flexibility for business travel, and gather data and expenses — all in a single, easy-to-use interface. Easy to use tools that simplify business travel booking process. With multiple supplier integrations — Travelstop offers best choice for business travellers. Automated expense reporting with simple approval workflow to improve productivity. Improved employee productivity. Employees tend to spend hours researching and booking travel every time they make a trip. 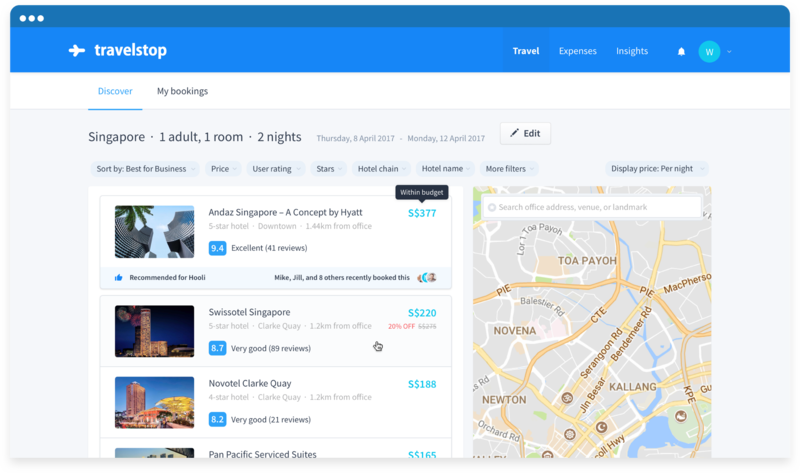 Travelstop uses advanced machine learning and AI-powered personalisation to make flight and hotel recommendations instantly. Flexible travel policy. Employees are generally unaware of travel policies — if there are any — and as such often fail to adhere to them. 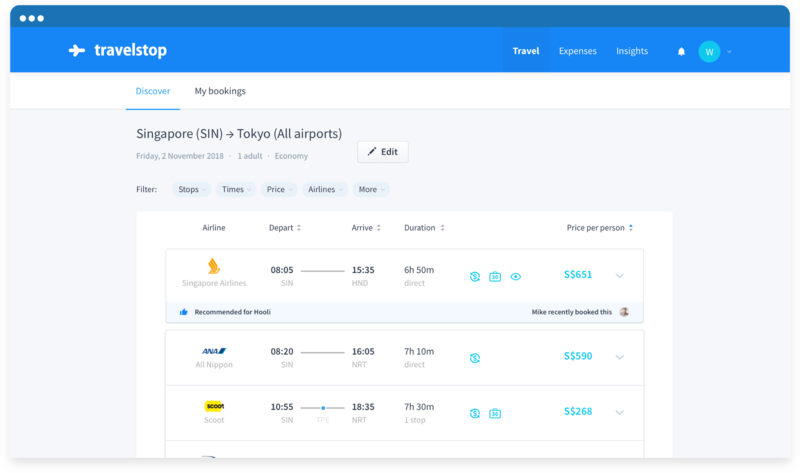 Travelstop allows employers to pre-approve a budget for business travel, giving employees the flexibility to book travel options based on their preferences. Automated expense reporting. Currently, expense reporting tends to be a manual process and is a hassle for both the employers and employees. Travelstop provides integrated tools to make expense reporting a breeze. Data-driven insights. Employers currently have little to no visibility on what’s being spent, and where it’s being spent. Travelstop provides data-driven tools that allow you to review expenses by organisation, department, team, or individual employee to make better decisions for cost savings. Affordable, self-serve process. Existing solutions are expensive and often require sales support to on-board and set up. Travelstop allows employees to on-board and get started with business travel booking using a simple self-serve process. Travelstop only charges for each active user, making it an affordable option. Consumer friendly. Employees are familiar with existing leisure booking sites, and as such, find business management solutions difficult and cumbersome to use. Travelstop provides users with a simple, modern, and intuitive user experience, which is localised for each region. As you can see, Travelstop was created for modern employers and employees alike. Whether you’re a finance manager who keeps the budget in check or a sales representative who hops from city to city on a weekly basis for business meetings, we believe Travelstop will become an inseparable part of your workflow.